not being patient. I will practice as long at it takes!" said Stillwater. "If you can do that, I am sure you will become a great dancer." 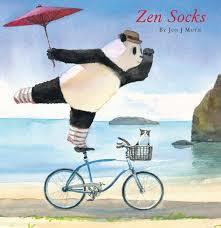 I love adding this book to my Jon J Muth collection of Zen stories. Stillwater is back, and ready to share his thoughts in a series of stories for Molly and Leo, his new neighbors. The two don't know what a treat they have in store. When Molly tells Stillwater that she wants to be the best ballerina ever ... and famous to boot, he tells her a story. Through that storytelling he helps her to understand the benefits of patience. Leo's story concerns being selfish and how that impacts on the way a person lives life. When the three are together at the beach, they find a multitude of starfish stranded on shore as the tide goes out. Can they throw each one of them back to the safety of the water? Perhaps not, but they can make a difference! Together, they work to do as much as they can to remedy the plight of so many of these beautiful creatures. As he did in Zen Shorts (2005), Zen Ties (2008), and Zen Ghosts (2010), Mr. Muth uses variety in his palette. 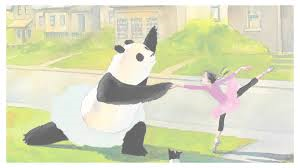 The Banzo story about patience is told in black-and-white using inks, while the stories with the children are done in beautiful, light-infused watercolors. They are expressive and full of emotion, allowing young readers to enjoy the peace of the moment and the joy found in quiet contemplation. Stillwater shares his sage advice so gently that his listeners will barely recognize the lesson being taught. Rather, they might think they always knew that. A wonderful read focused on kindness and taking the time to be the best you can be whether learning something new, managing to get along with others, or making the world a better place. It also reminds us that we can never be too busy to share a wonderful story! Huzzah! I have a new book to add to the basket of books I want to give every new baby! 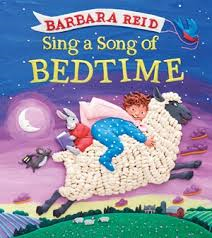 There is absolutely nothing better to do today than to celebrate Barbara Reid's new book of rhymes and lullabies. In this remarkable companion to Sing a Song of Mother Goose, Ms. Reid includes 14 favorites to share at bedtime ... or anytime. They will be familiar to many families. I never grow tired of poring over her stellar artwork, and often find myself returning to old favorites just to be amazed all over again. The double page spreads in this new book provide the text on the left side, festooned with a detailed image relating to the shared song or verse. Facing that is a full page illustration, filled to its every edge with extraordinarily detailed Plasticine artwork. Sure to be a classic, and deservedly so, this is a book that should be on every family's bookshelf, and in every new baby's start-up library. bent out of shape for long." I love the humor and the sentiment of this lovely new book by two very special friends. I trust that you have seen and love their other books. If not, may I please suggest I Wish You More (2015), Exclamation Mark! (2013), It's Not Fair! (2010), Yes, Day! (2009) and Duck! Rabbit! (2009). That should get you started! This time, they take geometric shapes to explore the concept of friendship, in its many guises. They are the perfect team to design a book for their rapt audience of young readers. I love all of the plays on words as they go forward talking about friends and what they do for each other. You will have recognized the fun as soon as you had a look at the book's cover and witty title. 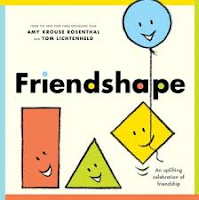 The rectangle, square, triangle and circle are best pals, and remain strong despite some minor blips in the course of their friendship. There are so many good reasons for each one of us to be surrounded by friends and they share many of them for us. Each page turn builds concepts for little readers, and often provides visual jokes for older ones. There is a lot going on here, and that is sure to encourage multiple readings. Isn't that the best thing about book favorites? I can't wait to share this and listen to the giggles as listeners catch the subtle humor and enjoy both words and pictures. Entertaining, sweet and sure to spark talk about friends ... and perhaps even an art lesson or two. with joy and ... love." "Called Kanji, it was imported into Japan in the 5th century. Kanji is still used alongside two other alphabets (Hiragana and Katakana), for writing Japanese. For nearly a hundred years, until the end of the Second World War (1939-1945), Japan's empire included Malaysia, Indonesia and Singapore. Japanese was an official language in these countries." This is a book that will prove useful in many school classrooms. It provides its readers with the means for saying 'hello' in 48 different languages. Imagine how much fun that will be for them! 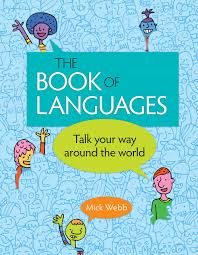 A quick look at the importance of language and its history, which also includes an overview of what is inside, scripts and pronunciation, dead languages, the oldest one, some intriguing language facts, and the ways in which certain languages are connected is our introduction. Then, the author moves on to introduce 21 different communication systems prevalent around the world. He begins with Arabic and uses a double page format, with text boxes, to list the countries that are Arabic-speaking, a short history of its use, a world map showing those countries where it is spoken, a list of greetings, the numbers 1 through 10, pronunciation help, an invitation for the reader to try a hand at universal greetings, and what it particular to the language itself. On the far right side of the spread, the letters of the alphabet are shown and named. I can just see kids sitting and poring over this book, then trying to speak with one another in unfamiliar (or perhaps familiar) languages. How empowering and welcome is that - for them to be able to speak to new students who may not be familiar with the language spoken in the classroom. Following the chosen languages, Mick Webb includes nonverbal language, sign language ( which I used sparingly when teaching because I knew only a smattering of signs and the alphabet), semaphore (which I loved learning when in CGIT), Morse code (which I found nigh on impossible to figure out) and even the variety of ways in which animals communicate with each other. A glossary, an index, and world maps at both front and back that teach children how to say hello and goodbye in labelled countries are most useful, too. It is a terrific starting point and worthy of a space in many classrooms, and homes. than you'll ever know ... "
If you are a fan of Nancy Tillman, you will most certainly want to add this new book to your collection. Uplifting and thoughtful, it pairs children and animals as they play together in all parts of the world. The children ride elephants, spend snowy days wandering in wonder, dance with tigers, and play soccer with kangaroos; all the while being reminded that they have a very special role to play in their own world. No matter where a child might live, or what their life might be like, they have a place in the world that is of great importance. a picture that needs you most definitely." They may never even really know how their actions affect others, but they are sure to have an impact. One good deed passes from place to place, making things better along the way. So, the kite that the young boy releases goes on to impact others. The mixed media artwork is attractive and holds attention, as we have come to expect from other Tillman works. "Peter and Harold watched from the upstairs window. They felt safe knowing that Lenny was there. He guarded the bridge - silently, patiently, but with no one to keep him company. "Do you think Lenny is lonely?" asked Peter." Peter is not pleased with the idea that he and his father are moving at all. 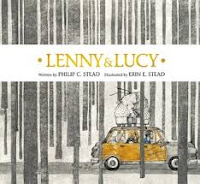 Couple those feelings with the trip taken to get to their new house through a dark and dreary wood, and you have the opening images for this atmospheric, fearful new story from the amazing Steads. "So the next day Peter made a tall pile of pillows. And after they'd toppled the pile six times Peter ran inside to find just the right blankets. He stitched and sewed and wrapped the pile up, tying it shut with string. He pushed and pulled and kneaded the pillows like dough." Lenny makes the perfect guardian, who is tasked with keeping the woods always on the other side of the bridge. Peter and Harold are happier. Knowing how much they count on each other for company, Peter discusses Lenny's loneliness with his canine pal. Another night of sleeplessness leads to the creation of Lucy, a companion. The four become friendly, and spend time together. When the young neighbor girl drops by to ask about owls and to share her binoculars and marshmallows, the four know they have found a soul mate. Erin Stead's magnificent artwork is the perfect touch. She uses a transfer process that accounts for the ghostly feeling throughout her husband's wonderful tale. The color is added only for the characters who people its pages and for the doors of the two welcoming houses that sit alongside each other on the right side of the bridge. A perfect picture book, and one of my favorites of 2015. Bravo! can. "Mouse? Are you in?" Can it be true that cats have nine lives? 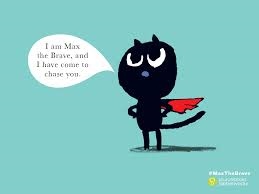 Max might, in fact, need a few of those as he sets out to find himself a mouse to chase. You should know that Max is very young (is that evident when you look at the cover?) and to tell the truth, he has no idea what a mouse even looks like. That doesn't stop our intrepid hero. He is willing to take whatever risks arise to catch that mouse, providing he meets one! Off he goes! He leaves no hiding place unturned. When he sees a fly he asks the pertinent question: "Are you Mouse?" Replying in the negative, the fly lets him know that Mouse is close by. He just saw him scurry past. He asks a fish, some birds, even an elephant, and finally a rabbit. Each of their responses is similar. Mouse asleep over there ... "
A surprise ending will have toddlers chuckling and immediately asking for a reread! It's so much fun, you won't mind at all. 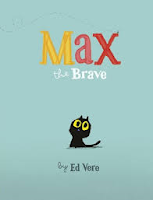 Ed Vere keeps the story simple, and the illustrations match the tale's tenor. He backgrounds his pages with variety in color, and keeps Max and those he meets the focus of our attention throughout the story. The expression-filled eyes pop, and the carefully constructed pages are the perfect entertainment for those who will soon be reading it on their own. I can't wait to see the upcoming Max at Night. "Nobody spoke like I did. Fleeing a war-torn land to find safety in another is a story taken from recent news reports, isn't it? It is hard for any of us to imagine, unless we have lived in such circumstances. Luckily, there are places that offer refuge for those who are threatened by a war not of their own making. Such a move can, at best, be unsettling. Everything is new, and strange. 'Cartwheel', as her auntie called her when she was happy and carefree before the war, leaves everything that is strange outside when she gets home. I called it my old blanket." Then, on a park outing, a girl smiles at her. She is reticent to return the smile, and walks on. It is a while until they see her again. When they do, she speaks ... words that Cartwheel does not understand. But, actions speak louder than words. 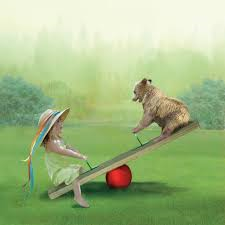 The girl keeps smiling, and takes Cartwheel to the swings. What fun! Cartwheel does not know how to express her happiness. The young girl is a born teacher, and brings new words to her recent acquaintance every time they meet. The lessons are not easy; but, Cartwheel begins to weave a new blanket of words. Soon, she has two blankets to make her warm and comfortable. Freya Blackwood's color palette is extraordinary. Cartwheel's world is orange, gold and brown; her new friend's is blue, yellow, pink and green. The two blankets match. The second blanket expands with each new meeting and grows in beauty, with Cartwheel's shoes providing an anchor in both worlds. The final image is full of the joy to be found when acceptance and friendship is offered so selflessly. Before we begin to read the story Sangmi Ko has in store for us, she reveals the main characters in a funny, and a bit terrifying, introduction. Mini and her mom are stuck in traffic, totally bored until Mini lets out a blood-curdling yell that sends her curious mother out of the car to find a shoe-wearing dog directly in front of their bumper. And now to the rest of the story. Mom coaxes the puppy over and stands in the middle of the traffic jam looking for an owner. Finding none, they take the dog home with them. Did I mention that the dog is wearing shoes? Yes, four tiny yellow foot covers! Mini is ecstatic, and can't get enough of him. They play until the dog is no longer in the mood to entertain, or be entertained. He prefers howling. Mini's mother offers an explanation. Mini doesn't want to hear it. "Mimi, I think he's missing his family," said her mom. "He's my family now. I found him." "He isn't crying. He's singing." "His owner must be looking for him." "But he has no dog collar! He doesn't belong to anybody." "He has shoes," said her mom. "He belongs to someone." Mini wants so badly to keep him. She decides a walk might be just what he needs. With appropriate supplies bought, they are off. Mini's dog quickly becomes the main attraction. When the dog runs away, Mini is heartbroken. Finding him again has Mini thinking about his owners and how they must be feeling. She knows what she must do. All's well that ends well, for the dog's grateful owner and for Mini. 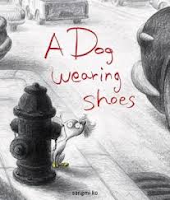 Now, I could read this lost dog story without showing the illustrations to my audience. They would enjoy another lost dog story and the end results. There would be none of the fun experienced when given the chance to see (and then pore over) the pencil and digitally colored artwork. The humor and energy that is evident from the get-go takes readers on an emotional ride from discovery, to reluctance, to loss, to joy. I have pored over its pages numerous times, always finding something I missed the last time. It is a 'keeper'! and leap into new adventures. and find peace and solitude." In her first book for children, and inspired by a wish to have her young son know more about his Anishinabe culture, Danielle Daniel offers a lovely look at her own aboriginal roots. In the tradition of the Anishinaabe people, all children belong to an animal clan. Their totem animal will be a guide throughout life, both spiritually and physically. There are twelve totem animals introduced. The descriptions of each is poetic, four lines in length. They face the illustrated page of a child wearing a mask that represents the animal described. Using acrylic on canvas, she entices her audience to look closely at the masked children. The colors are strong, the faces full of expression, and the appeal evident. Using poetry to describe the child and totem ensures careful word selection and apt descriptions. 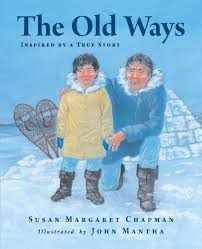 It invites young readers to make connections for themselves when comparing their behaviors to that of a totem. The animals are diverse, their character evident in the words. 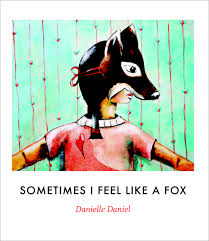 In back matter, Ms. Daniel includes a full list of the animal totems and their most evident trait. Her author's note provides an excellent description for the traditional ways. Simply beautiful, and fascinating for those wanting to know more about aboriginal culture! "When they were babies, Toka and Iringa roamed with their families in the warm, dry climate of southern Africa. They explored a vast territory, with hills to climb and streams to cross. They foraged for grasses, fruit, branches, and bark." 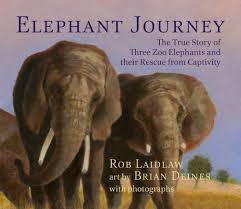 I have long admired the work that Rob Laidlaw does to help protect wild animals from the indignity of being held captive, whether by a circus or a zoo. 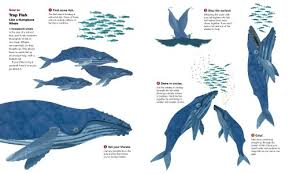 His books for children have informed, enlightened and encouraged readers to get involved in making a difference in the life of any animal. "The zoo in Toronto was nothing like Southern Africa. The ground was hard and dry, and uncomfortable on their feet. The enclosure was too small to roam about, so without exercise, the elephants gradually became weaker and out of shape. And it was cold in the winter, too frigid for elephants used to the warm sun of southern Africa. Toka, Thika, and Iringa were the last elephants at the zoo in Toronto. Two years of wrangling over where the elephants should really be led to a final decision by Toronto City Council to move them to California. Another decision was made to ship them on flatbed trailers that had been equipped with specially designed crates to keep them safe during their extremely long journey. Once loaded, they were off. With experts monitoring their condition from an accompanying van, the carefully planned trip was carried out, with only a few minor glitches. They were warmly welcomed by staff, and other elephants, when they arrived at the PAWS sanctuary. Given time to acclimatize, the elephants were soon set to explore their new home and begin healing. They were soon healthy, happy and much stronger. "Sadly, Iringa's long history of degenerative joint and food disease - the leading cause of death for elephants in zoos - caught up with her and she was humanely euthanized on July 21, 2015. She was 46 years old. Iringa was born in the wild but spent most of her life in zoo captivity. I'm so glad she had a chance at the end of her life to roam the hills, eat natural vegetation, and enjoy a peaceful life in the company of other elephants. Iringa will be greatly missed." "Boniface put on a burst of speed, leaving the others behind in his dust! Then he heard little Mueni crying. Suddenly the race didn't seem important. As the biggest, he had to care for the littlest. Boniface stopped and waited. Mueni wasn't hurt, just afraid of being left behind ... and alone. She'd spent so much time alone and afraid." 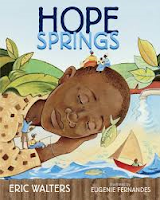 Eric Walters has now written two picture books based on his experiences with the children from the Mbooni District in Kenya. It is a very dry area, and the people there count on two rainy seasons to provide the water they need to live. When there is no water, everyone is at risk. This book is based on a true story of a time when the much anticipated rainy season did not happen, and the orphanage was in dire straits. The children were happy to take water containers and fill them with water from the village well. The water was a slow trickle and the women and children waited patiently for their turn. 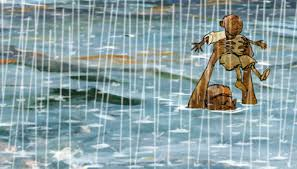 Until one day - on that day, Boniface and the other orphans were threatened by two angry women who questioned their right to share the water. In the end, the children were forced to leave without what they had come to the well to get - precious water for the orphanage. Their house parents explain that the women are not mean, they are afraid. They fear they will not have enough water for their families. As the oldest, Boniface is concerned and feeling responsible for not returning with what they needed. Ruth and Henry reassure him, and remind him that their well should soon be finished. Then, they will have all the water they need. In the meantime, friends will help to get the water when there is no lineup. When the well is finally completed, and the pipes connected, there is enough water for everyone at the orphanage ... not for the people in the valley, and that doesn't sit well with Boniface. He has a suggestion for some work in the spring. It seems the perfect solution, and speaks clearly of kindness and compassion. 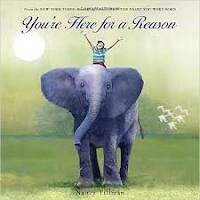 It shows young readers that everyone can make a difference - large or small. It all counts! Eugenie Fernandes use acrylics in bold colors to take us to Kenya, and give expression to the children and adults who live at the Rolling Hills Residence there. She evokes the strong emotions felt when water is at the heart of existence in a land where it is extremely scarce. In 'The Story Behind the Story' the author provides information and much appreciated photographs from the story that inspired him to tell this one. This is what I refer to as 'faction' - a story told to incorporate real information. "Wolves dream of running free. But this wolf did not want to run. Wolves love to play. Yet this wolf had no interest in the sports of his brothers and sisters. Without him, the pack ran and played under a grand Sky..."
Here's another terrific book about the Arctic from Inhabit Media. It tells the tale of a wolf who isn't too pleased with his lot in life. He doesn't like to run, or play like his siblings. Rather, he spends his time carefully considering other animals who live on the Land. He likes the caribou's antlers, the wolverine's tail, the white feathers of an owl. He spends little time with his family and does not join their hunts. Lonely and alone, he howls out his unhappiness to the Sky. In folktale fashion, his desire to be like other animals becomes reality. He finds caribou antlers, and wolverine hair, and even steals a feather from an owl. "He had no wings, so he could not hunt like an owl. not sniff out food for himself. He runs from the pack. The mother wolf finds him and offers sage advice, and a solution to his loneliness. Another excellent tale to share with little ones. Alan Cook's lively art shows the beauty of the Arctic and its animal inhabitants. 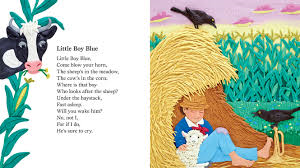 His palette of browns, blues and whites make the landscape come alive for readers and his depiction of the animals show their grace and strength. "The Quarrymen played one of their gigs in the back of a truck ... Soon they were playing at parties, school dances, and even a real music club, the Cavern. But when the Quarrymen launched into their first song, the manager almost kicked them off the stage. Skiffle groups weren't supposed to play rock 'n' roll! Some of the boys were ready to quit." Luckily for fans, and for the world of music, John Lennon (musical leader of The Quarrymen) didn't give it up when faced with the trials of making a living playing the music he so loved. 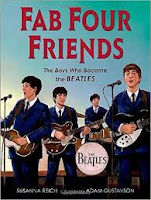 In this new picture book biography, meant for a younger audience, the author chooses to chronicle the early lives of each one of the boys who became The Beatles. It is told with careful attention to their upbringing, their love of music, the path they take to form a band that takes the world by storm. Susan Reich begins with John. After his parents divorced, his mother was often absent from his life. John lived with his Aunt Mimi and Uncle George and dreamed of being an artist, or a poet. With George's untimely death, John turned to music for solace. His mother noted his growing interest and bought John his first guitar. His first band was The Quarrymen, and although the others were ready to quit when facing adversity, John was not. Paul heard John play at a church fair, loved his music and later played a few songs for him. It was a beginning. Paul's home was filled with music of all types. After his mother died, he played his music to assuage the pain. He loved rock 'n' roll. After meeting John, Paul joined his band. They wrote songs, played guitar together and dreamed of being like their rock 'n' roll idols ... Ray Charles, the Everly Brothers, Buddy Holly. George was Paul's friend. He loved listening to The Quarrymen and was doubly impressed with John. He worked tirelessly to improve his guitar playing. He was soon playing lead guitar with The Quarrymen. Life was tough for the three as they tried desperately to forge their music into a viable vocation. They became The Beatles and found work in Hamburg. "Before long, people were pouring into the club. Hour after hour, night after night, the Beatles worked the crowd into a frenzy with songs like "Good Golly Miss Molly", "Whole Lotta Shakin' Goin' On" and "Great Balls of Fire.'' The Germans went wild!" Their return to England was not auspicious; but, they finally managed to find a producer who liked their sound and agreed to cut four Lennon-McCartney songs. All they really needed now was a drummer. Richard Starkey lived with his grandparents and loved adventure games with his pals. He was often sick, and spent extended periods of time hospitalized. While there, he fell in love with the drums. He eventually quit his factory job to find work as a musician. He would need a new name. Ringo became the fourth member of The Beatles in 1962. One year later, they had two hit songs, a firm friendship, and were on their way to making it big. "Those boys had poured hundreds of hours of sweat, love, and teenage energy into their music. Their songs were irresistible and they were the best of friends." 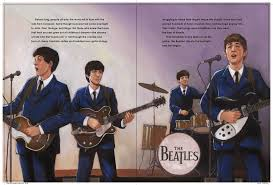 The realism of Adam Gustavson's oil paintings will engage young readers, while providing an accurate picture of the time, the endless work and the close friendship that resulted in the growth of one of the most influential bands in musical history. What a gift this book is! Back matter includes an author's note, a glossary, quote notes, and the sources used to do the diligent research that makes this book exemplary. "In the morning Simon watched his grandpa getting ready. Ataatga attached a sled to the snowmobile and loaded some big leather bags onto it. Simon heard the clanking of tools and knives from inside one of the bags. Then his grandpa added a large gas tank and a container of oil. Ananaksaq got the warm caribou parkas and put them on the sled." Simon returns from his day at school to regale his grandmother with stories of using computers and watching movies. When his grandma wants to share an old tale about Sedna, Simon runs to watch one of his favorite television shows. Then, it's homework that needs to be done. While Simon is busy with that, his grandfather returns and invites Simon to come outside and learn to build an igloo. Simon sees no purpose in the old ways. He would rather play video games. Ataatga is disappointed. Then, he reminds Simon that they will be taking a snowmobile ride to Igloolik to celebrate Aunt Mary's birthday. day. Soon a blizzard is raging. Ataatga is concerned. The stored caribou skins will keep Simon and Ananaksaq warm while he builds an igloo. Once they are safe and warm in its enclosed space, there is time to cook food, and to tell stories. In the morning, there is no sign of rescue. Grandpa makes the decision to walk the twenty kilometres to find help. Simon is afraid. But, he stays with his grandma as Ataatga sets out on his snowshoes. All day he and his grandmother share stories as they try to ignore their hunger and their concern for Ataatga. Just as the sun is setting, they hear the hum of snowmobiles ... they are rescued! 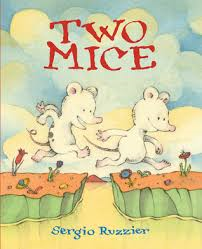 This is a story that could preach its message to young readers. Instead, it creates a world that values both the old and the new. There are benefits to both. After their trip Simon can see that respecting one's heritage has value, and knowing how to be safe in a harsh environment is vitally important. John Mantha's artwork shares a world that few readers will have experienced. Warmth of family love is evident, as is the power of nature to threaten life. His use of warm colors for the interior scenes contrast sharply with the cool colors that show the drama of the approaching storm. These images add context and depth to a story well told. way it makes the nest. THEY HAVE GONE AND DONE IT AGAIN! Steve Jenkins and Robin Page continue to make books that astound and inspire young readers with an interest in the natural world. I am delighted to tell you about this most recent one. If you want to know the step-by-step process that the tailorbird uses, you might just have to get your hands on this glorious new book from the husband-and-wife team who ask the best questions, and then answer them. When it comes to encouraging us to be always learning, they do so by sharing an abundance of knowledge that we didn't know we wanted to know. They make the learning so much fun. 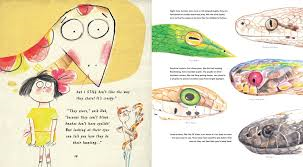 In this book we discover more than a dozen animals and how they find food, build homes, repel pests, attract a mate, protect themselves from detection, warn of danger, put up a defence, and even swallow a pig for heaven's sake! The instructions are clearly stated in a numbered method. The exceptional cut paper collage artwork is classic Jenkins fare, and the touch of humor ensures absoluteinterest in how animals of the world do such things. over the branch of a tree. breath, and it will suffocate. And that is 'how to swallow a pig'! "Nobody even looked at him. important man with a busy job)." 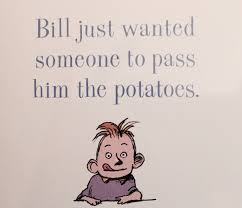 Every child must, at some point, feel exactly as Bill feels when he asks for the potatoes and no one in his family even notices. They are busy with their own affairs. One thing leads to another until everyone is paying close attention to his sister who is juggling the 'edible tubers' that Bill has requested. That's when it happens ... Bill turns invisible. Yikes! We are living at a time when there are so many distractions, and such demands for our attention, that some of the basic tenets of family life are being cast aside. Kids are very vulnerable to our lack of attention, and often feel that they don't really matter in our rush to react to all that is bombarding us. They feel as if they have no power and are easily frustrated by being ignored. We all want (and deserve) to have a voice. While done with a humorous tone, it is a tale that needs to be told today, I think. All Bill wants is someone to pass the potatoes, please. It isn't until dinner is finished, and the family is preparing to clean up, that they notice he is nowhere to be found. Once he gets their attention, they are angry that he has chosen to be 'invisibill'. A trip to the doctor is arranged. The doc prescribes permanent markers. Looking like a pumpkin head, he goes to school where he is laughed at and chided all day long. "Where's Bill?" asked Bill's brother and sister, who did not want to get stuck taking out the trash by themselves." Perhaps, that is all I need to say. Dusan Petricic created his fascinating artwork in pen and ink, then colored in Photoshop. His images add depth through his use of frames to contain the characters and the action. His humorous expressions and situations enhance this quirky story of a boy who longs to be noticed by his busy, distracted family. I would love to share this in a classroom, and see what the audience has to say about it! points him toward his subject." 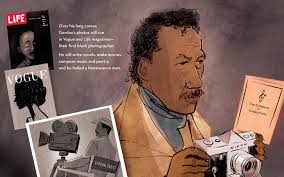 I did not know Gordon Parks' story. That is what I love about picture book biographies! I am more informed now than I was half an hour ago. His is a captivating and necessary story to tell young readers. My son knew him as the first black director in Hollywood and knew some of his work. It's always fascinating to learn what others close to us know! He was also the first black photographer hired by Life magazine. In her new picture book biography, Carole Boston Weatherford touches on his birth and early years before sharing that Gordon was 25 years old when he bought his first camera ... a used one that cost $7.50. What a grand decision made, as it led to his life's work. So talented that he quickly has an exhibit of his work. That leads to the world of fashion, and a move to Chicago. His photos of South Side poverty leads to a government job and another move, this time to Washington, D.C. There, he finds his calling. He becomes quickly aware of the plight of black families living a very different life from their white counterparts. It is a revelation to him. Thus begins his work to show the world what racism looks like through his camera lens. A cleaning lady in his workplace offers a poignant and inspiring subject. In his lifetime, with all the accolades and success, his most impressive photograph is one taken of Ella Watson showing her struggle to support and provide hope for her family. "Gordon Parks - American Gothic" by Gordon Parks - Library of Congress Prints and Photographs Division, Farm Security Administration - Office of War Information Photograph Collection. His is a fascinating story, and is told brilliantly by Ms. Weatherford. The images created by Jamey Christoph are equally compelling, assuring readers a close look at the very important work that Gordon Parks accomplished in his lifetime. An afterword, an author's note and archival photographs are most helpful. "Their glasses were too big. Their wings were too small. At least half a dozen had inhalers. They all liked to read. Nerdy is good at some things, too. 3. Reading about video games"
Yep, nothing in common! The 'cool' birds don't care about his interests, unless it's eating 'bookworms' for breakfast. 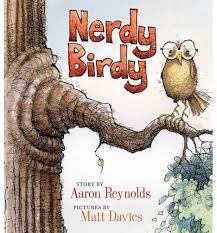 When the others fly off, Nerdy Birdy is alone and very lonely. That is, until he hears other voices that invite him to hang with them. They always have room for one more ... until they don't! 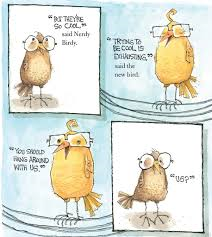 Nerdy Birdy makes an interesting discovery about those birds who are too cool to be with others. He also makes a discovery about himself when another lonely bird makes her way to their neighborhood. The two have little in common, but that doesn't seem to matter. Matt Davies uses pen and ink and watercolor to introduce his audience to an assemblage of the most wonderful characters; some are likeable, some not so. It matters not. They will hold attention and spark interest for those listening to this wonderful story. Very funny, while also holding out hope for finding true friendship. 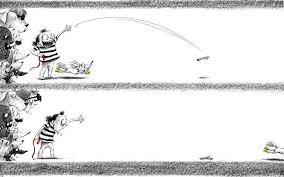 "The penguin eyed him suspiciously then went back to skidding on its belly. Ephraim tagged along after it. He had only ever seen illustrations of penguins before, and he'd thought that they looked solemn, as though they had dressed for a funeral. But they were such funny birds in person. They paddled against the ice with their wings and feet just like they were swimming. They trumpeted and nipped ... "
Grandpa Ephraim and Micah have only had each other since the death of Micah's parents. Now, Grandpa Ephraim is dying and Micah desperately wants to change that. Grandpa has been telling his young grandson stories about Circus Mirandus since their first days together. It is an enchanting place, only seen by children who believe and who need its magic. Micah loves the stories, but is not sure they are true. A solemn return message from the Lightbender motivates Micah to find the circus his grandfather has dearly loved since his own boyhood visit. Jenny Mendoza agrees to accompany Micah on his quest. She is a young girl with a scientific mind and doesn't really believe in magic. But, she and Micah have a strong friendship despite their many differences; it is that which propels Jenny's actions. Together, and with the help of the circus' crusty messenger parrot Chintzy, they find Circus Mirandus and meet its many very intriguing performers. They are bent on keeping magic alive in a world where too many children feel hopeless, lead by the Head and with help from The Man Who Bends Light. The outcome is not as Micah had hoped; there is nothing the Lightbender can do to save his grandfather. He can, however, provide that much needed miracle. This is a grand story. The characters are admirable, and memorable. Believing in and trusting others is at the heart of the tale ... along with a pinch of magic, of course. Death is dealt with in the best possible way for its middle grade audience. Magic and reality are well mixed. It is a terrific read, and would make a wonderful readaloud for your family, or in your classroom. "The skunk did not answer. The skunk was a skunk. I bought the skunk an apple. I gave him a saucer of milk. I offered him my pocket watch. 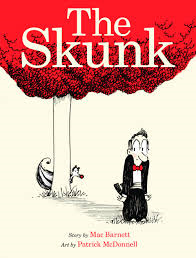 Upon opening this lively story, you might just ask yourself about the skunk. Why is he waiting on the doorstep for the man to come outside? There is no indication that he rang the bell. Present he is, and the tuxedoed man is quite surprised by the turn of affairs. He certainly doesn't want to upset the skunk. He is stealthy in his departure. It takes no time to realize that the skunk is following him. This is one determined skunk. Down the street, and always aware of the man's efforts to evade, the skunk follows him to a coffee shop, around many corners. The man tries his best to distract the skunk. Nothing works. Into a departing cab, and to the opera where the man is sure he has lost his pursuer. Not at all true! The skunk finds a most pleasant spot to watch the performance. The man leaves quickly with the skunk right behind him - to a Ferris wheel, to an alley, to the sewers, always determined to lose the skunk. Upon exiting the sewers, he finds himself in a new area, promptly buys a house and starts all over again. There is no skunk in sight. Can it last? It appears that he has solved his dilemma - until he begins to wonder what the skunk is doing! Mac Burnett chooses his words carefully and writes a story that moves quickly, and with great panache. I can't wait to share it! Patrick McDonnell matches the humor with exceptional illustrations that hearken back to earlier times. He matches the man's tuxedo and his red bowtie to the skunk's coat and his bright red nose. The first part of the book is done with little color - black, white and gray with splashes of red. Settling in a new house allows for a brand new color palette - primary colors and a circus-like atmosphere. Full of expression and action, kids will enjoy every spread. 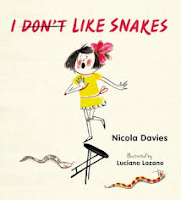 have legs, so they bend ... "
I love the way Nicola Davies tells stories that allow her readers to learn a great deal of factual information. She has done it before (One Tiny Turtle, 2001, Dolphin Baby, 2012, Just Ducks, 2014) and we can only hope that she will do it again ... and soon! In this girl's family the pet of choice is the snake. She is not inclined to be a part of the admiration society. For every reason her family members have for loving them, she can think of a conflicting theory and an absolute reason for not doing so. Following the above interaction, Ms. Davies clearly explains how slithering works. The snake grips the ground at its tail lend with the scales on its underside and stretches forward with its head end. Then it grips at the head and pulls the tail end forward, and starts all over again. The snakes uses its scales for grip and presses against the round and against objects on either side with the curves of its body, to push itself forward. When a snake needs to move without any side-to-side wiggling, the scales under its head and neck grip the ground while its tail end scrunches upward and forward, like an inchworm." Hmmm! For every single argument she has against liking the slithery things, her family have expert reasons to dissuade her. Some of her beliefs have no basis in fact, while others are exactly right. They do slither! Funny at times, and positively scary at others, this exceptional nonfiction picture book will entrance and inform readers with accurate information. Luciana Lozano uses mixed media to introduce us to snakes as they live in the family home and in the wild. Often close-up and very detailed they are sure to impress those who share the family's love of these oft-reviled reptiles, and may even convince some of us to reconsider our strongly held opinions concerning their need to be in our natural world. There is a lot to learn here, not the least of which is how they 'kill their prey'. 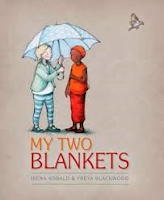 Combining research and quality writing, Nicola Davies adds this book to a long list of exceptional reading for children. Thank you! Rose doesn't fit Mrs. Benson's mold. 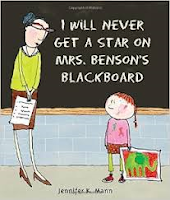 Mrs. Benson provides stars for all of those things Rose is not good at - being neat, perfect spelling, right answers. Rose is better at doodling on her papers and especially at daydreaming. You know that kid, don't you? She doesn't do well at math on the blackboard, or reading out loud in a voice that can be heard by her classmates, or serving snacks. Even the end of the day brings no joy. Mrs. Benson is going to check desks for neatness. Again, Rose knows there will be no star for her. The bell rings to bring a reprieve until the following morning. The next day Rose is early enough to get ahead of the game. By the time school starts, her desk is gleaming. A final assignment to create a thank-you card for the visiting artist, who inspired Rose to dream about being just like him, results in an even bigger desk mess than yesterday's. What kind of trouble is in store for Rose this time? We can put a lot of pressure on those kids who don't conform to what is considered 'normal' in our classrooms. This book is a celebration of what makes each of us special. 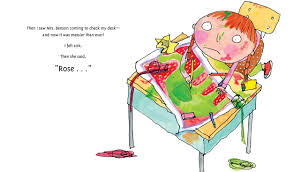 Ms. Mann portrays Rose as a creative, enthusiastic artist whose bright clothing, and need to dream is endearing. 'Be yourself' is the message she so honestly portrays. Mrs. Benson has her own heart of gold when it really comes down to it, and she honors Rose and her enthusiasm. Shouldn't every child and teacher be star-worthy - for reasons of their own? with a knife to escape. Ten years ago, in late August, I was in Ohio to spend time with my mom's best friend (and my best friend, her daughter), who was losing a long battle with the cancer that was ravaging her body. We spent our days sitting together, talking and sharing memories. We also spent hours glued to the television screen watching the devastation that Hurricane Katrina was wreaking on the southern gulf coast and the city of New Orleans. It was hard to watch as so many were plunged into the terror of having their lives changed forever. Not much has made me as angry as the pitiful response to the plight of so many, the failure of the government to take responsibility for the evacuation, and the lack of a clear plan for the safety and support for those in need. I continue to feel that way, knowing that it is the tenacity of those who want their homes and neighborhoods back that continues to make things happen ... TEN YEARS LATER! to safety, but they are nowhere to be seen." 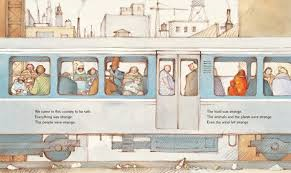 Five trains leave New Orleans empty." The gritty, sombre illustrations almost tell the story on their own. But, we would miss too much were we not able to read Mr. Brown's unforgettable account. It is a painful story to tell. He tells it eloquently, and with great empathy. I could not put it down. It fueled my anger; it also inspired with its tales of heroism and help, offered by people of the world. Many scenes are shocking, truthful and ultimately empowering. It certainly adds to my admiration for this stellar artist. Back matter includes comprehensive source notes and a very useful bibliography. 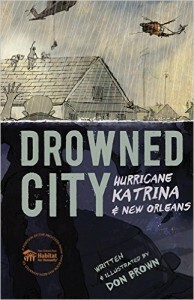 Don Brown dedicates the book to “the resilient people” of New Orleans and the Gulf Coast, and a portion of the proceeds from the sales will be donated to New Orleans’ Habitat for Humanity. "Marvelous Cornelius!" they cheered. "Marvelous Cornelius!" At each home, Cornelius sashayed to the curb and shimmied to the hopper. Unloading the garbage, not a single praline wrapper ever stayed on the streets. And those spotless streets, oh, how they sparkled." who swept his job well." Then, Hurricane Katrina changes the landscape for Cornelius and the people of New Orleans. In her wake, she leaves mountains of trash, death and destruction that is hard to fathom. Cornelius is sad, but resolute. He will work with the people he knows, and those who come to help, to the best of his ability to bring joy to his beloved city. Cornelius inspires others with his drive and dedication, and his need to bring back the 'sparkle' that is missing since the storm. Based on a true story of a man who did his part and loved his job, Phil Bildner presents an unsung hero whose story deserves to be told. In an author's note, he shares how he came to know about Cornelius and his desire to help tell his story for a wider audience. His work is exemplary and a real tribute to the man. John Parra's painted artwork is textured and focused on the streets of New Orleans, the streets that Cornelius loved. Filled with motion and liveliness, he brings the city to his readers and allows us a look at the spirit that has remained so strong in the aftermath of such devastation. 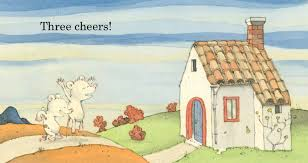 I cannot wait until Sicily is old enough for us to share the Kevin Henkes collection on my library shelves! He does everything with such a gentle voice and has an uncanny ability to capture the essence of childhood. I have long been a fan. So, I was thrilled to receive a copy of Waiting. As I said, he knows young children. 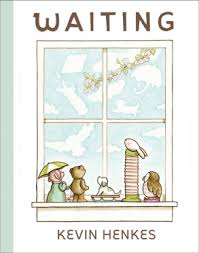 In this new book, he helps them understand the idea of waiting ... a most difficult concept when you are young and not inclined to want to wait. His characters are tiny toys, sitting comfortably on a window ledge, each one waiting for something - except the rabbit who 'just liked to look'. The text is just right. The full-colored artwork is beautifully rendered in brown ink, watercolors and colored pencils. He carefully creates the secret world where toys reside, without interference from the human world. As their waiting is rewarded, each of the toys is happy, including the rabbit who just likes looking out their window. They live quiet lives, sleeping and waiting. When a visitor arrives and subsequently leaves, we learn why it will never return. Their days are filled with new discoveries and much enjoyment. When a cat joins them, she seems to have nothing on her mind. Wrong! Never impatient with their lot in life, they happily spend time together in preparation for always being happy. It is a lofty goal. Emotional in its simplicity, and beautifully drawn, don't 'wait' to add this book to your collection. 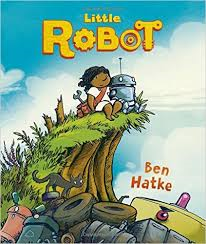 Oh, you are going to love the little girl you meet in Ben Hatke's terrific new graphic novel. If you know his other work, you will have met Zita the Spacegirl. Now, you have a new heroine to admire, and you don't even know her name. It matters not! 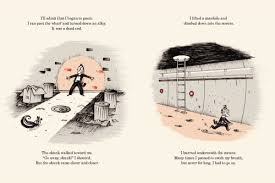 A beautifully detailed and wordless forward allows readers to discover the single event that sets the story in motion. A box is bumped from a delivery truck, bounces off a bridge and lands in the waters below. It floats lazily along a meandering river. When we meet the wee girl, she is furtively making her escape from her trailer park home by climbing out a side window. She makes her way to the bus stop to watch all the children leave for school. A hole in the fence allows a romp in a nearby backyard where she swings happily until the owner comes to the window. She flees. We are quick to learn this is her pattern for the long, lonely days on her own. She fishes a tool belt from a hiding place, and is on her way to new exploits. Lo and behold, she sees the floating box, fishes it out and makes a new friend - a shiny robot who matches her in size. She helps as it struggles to find stability on land. Then, off they go. As she shows her new friend her world and fixes him when he needs to be fixed, the two don't realize that his absence has been noted, or that a seek-and-recover robot has been sent to find him. This pushes their story forward at a pace that will have young fans racing to find out what happens. It is virtually wordless, and totally captivating. Full of the kind of adventure that every young child longs for, and understands. There are many lovely, quiet moments. They are made sweeter by the frenzied action that results with the addition of the much bigger robot bent on doing its job and bringing the little one back to the fold. It will be read again and again, as young 'readers' savor its story. worthy of our attention. I do hope we meet her in some future adventure.